Thanks GM. 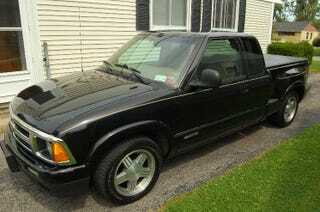 These were the pics I was preparing for sale of this truck...in 2008. I guess ten years of age and 75,000 miles was too much to ask. A persistent electrical smell only during left turns was probably another sign. It was a GM electrical system. Aaaand this is where I mention It’s been an upstate New York truck it’s whole life, so then the burden of the rust is not on GM. However the electrical smell and 3 wiring harnesses (First crapped out at 55k, second was not installed properly aparently, and third was good enough I guess) definitely ARE! Now, I did like that interior! Fuel cutoff was at 95mph with a whole hell of a lot more to give. But then on Snow Tires around Lake Placid, that would be a stupid thing to do. The stealership wanted to give me $2,500 trade-in value even though the Blue Book said $4,000. Black Books weren’t yet published and I let them know how much crap they were delivering. It’s said that the perfect deal happens when both sides feel screwed. I’m not so sure they felt screwed.